Newark historian Jean-Rae Turner's research shows that more than 1 million people are buried in Newark cemeteries. Many of the burial grounds have literally gone out of business over the years, covered over to make way for so-called progress. Some have been ravaged by vandals. Others, like Mt. Pleasant, continue to stand as historic monuments to people and times long past. Last week we took a look at the city's two oldest burial grounds – the Old Burial Ground west of Broad Street at Market and the Old First Cemetery further south on Broad St. Today, we continue our city cemetery tour, beginning with the Second Presbyterian Church site. Second Presbyterian Church, founded in 1810 at Washington and James streets, was located behind the church building on property facing Plane Street (University Avenue). Even in its heyday, this cemetery was not a particularly attractive resting place for the dead. The Newark Daily Advertiser of June 25, 1884 described it as 'God's Forgotten Acre,' saying, 'The grave stones are laying in heaps, or if still marking the grave are inclining toward the earth and covered with a rank growth of weeds and underbrush. From all appearances it is the harboring place of tramps, and in the center there is evidence that thieves have made it a safe locale for the secretion and division of their plunder. The entire lot is thickly strewn with cans, straw, ashes, broken crockery and refuge of every description strewn throughout.' By 1901, the cemetery was covered over and the bodies were then moved to safer ground. Not too much is known about the cemetery of the Third Presbyterian Church, other than it was located adjoining the church building on Halsey Street between William and Hill streets and that it appeared in the Newark fire insurance atlas of 1889. Trinity Church Cemetery was located, not in Military Park as was the church, but rather on a portion of land much truncated in later years between Rector Street, old Saybrook Place, Park Place and McCarter Highway. Gradually the cemetery was reduced in both size and importance, just as the significance of two cemeteries of Old First had been diminished by commercial expansion. The life of Trinity's cemetery extended from about 1810 until the end of the 19th century. During that time some graves were relocated on at least three separate occasions, twice without much reaction, but once with great anguish. The cemetery had become completely overgrown and for all practical purposes, was forgotten. 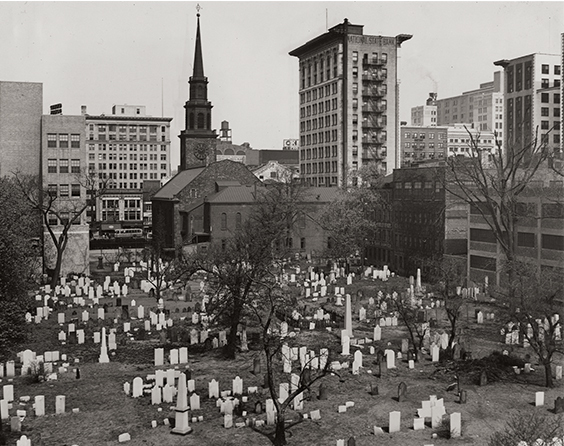 With the construction of Cathedral House in the 1930s, graves were moved. By the 1960s, the much-diminished place was almost completely hidden from view by surrounding buildings. In the 1960s, I can remember looking out a Rutgers classroom window into a tangled mass of broken headstones and monuments clogged with vines and heavy undergrowth. While Trinity attempted to locate the families and descendants of the graves' occupants, a parking lot was eventually built over the site. In the 1990s a heady controversy flared over the final relocation of the graves of old Trinity parishioners as members of an African-American community group protested use of the land for the New Jersey Performing Arts Center. According to a 1993 Star-Ledger article, 50 graves were excavated, supposedly a 20 percent sampling of the burial site. The state-directed archaeological dig revealed more headstones, medallions, false teeth, a woman's comb, buttons, coffin nails, and several pieces of glassware. St. John's Cemetery, Newark's first Roman Catholic burial ground, was established about 1840. A reference to it appears in Walling's Map of Essex County in 1859. In 1863 the Newark City Directory referred to it as St. John's Cemetery, and in 1913 Urquhart's History of Newark described it as a 'small plot on the hillside, looking toward the then beautiful Passaic' and calling it 'a well-nigh forgotten burying place in the rear of St. Michael's Church, Newark, on the corner of Belleville (Broadway) and Fourth avenues and was there long, long before St. Michael's parish was dreamed of.' In 1960 the cemetery was covered over and the graves moved to North Arlington. Newark's Mt. Pleasant Cemetery was founded in 1843 by a group dedicated to the idea of establishing a Victorian rural cemetery in town that would be a place where the dead could be laid to rest as well as one of great beauty and dignity. Nineteenth century Victorian-America made death an art form. It was a time when beautiful cemeteries were created where trees, flowers, finely sculpted monuments and markers, and lush landscaping complemented and honored the life of the deceased. Newark's Mt. Pleasant joined with Boston's Mt. Auburn and Brooklyn's Greenwood cemeteries as America's finest. To qualify as a rural cemetery several requirements had to be met: beautiful landscaping, winding paths and carriageways, and a profusion of grave markers. Mt. Pleasant's park-like setting included horse chestnuts, dogwoods, sycamores, lindens and maples. The paths and carriageways were named for ash, locust, poplar, walnut and willow. Ivy, honeysuckle, jasmine, lavender, greenbrier, almond, woodbine and primrose were everywhere. The park's classical gateway was at the Broadway entrance, made of Belleville brownstone and designed by Thomas Stent in high Victorian motif. Double hinged wrought iron gates and a projecting bellcote greeted the visitors. Mt. Pleasant is laid out in family plots. Monuments are of Gothic, Romanesque, Egyptian, Baroque, Neoclassical, Victorian and Art Deco styles. All manner of crosses are found from simple to elaborate. The rich built their own mausoleums in a variety of styles, the largest designed for Prudential Insurance Company founder and president, John Dryden. One very unusual memorial is the Firemen's group. This burial center for Newark firemen is presided over by a tall pedestal topped by a handsome firefighter. The stone gates of the memorial are formed of upright hose nozzles, bracketed by hooks and ladders. A pipe fence around the plot is supported by stanchions resembling old-time fire hydrants. The list of the famous buried in Mt. Pleasant includes Seth Boyden, Frederick T. Frelinghuysen, Newark Mayors Julius Lebkuecher and Thomas Peddie, and Gov. Franklin Murphy. The graves of Thomas Edison's first wife Mary Stillwell, and Samuel Augustus Ward, composer of the melody for America the Beautiful, can be found there along with those of the great industrial and commercial families of McCarter, Clark, and Ballantine. After a century and a half, Mt. Pleasant remains an oasis in the city landscape, still beautiful, still open, and still sheltering past giants for future generations.